I’m excited to give a hearty “Welcome back!” to our Coffee with a Rockstar column. 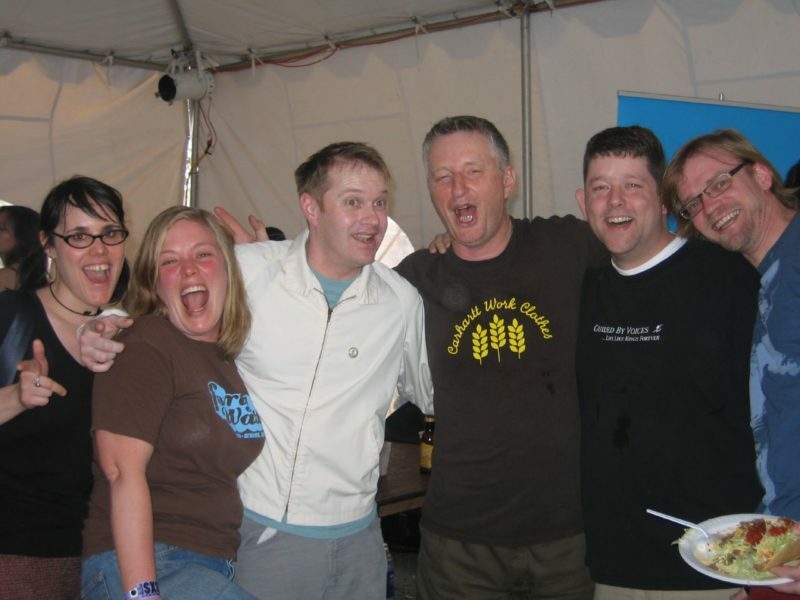 We started it back in 2003 (about 10 years before Jerry Seinfeld started drinking coffee with comedians) as a way to find out the coffee preferences (and other important details) from our favorite musicians. 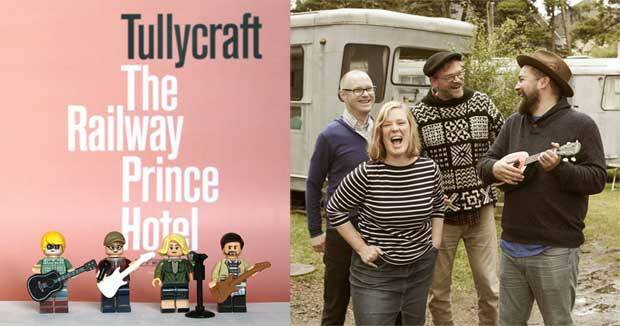 Tullycraft is a Seattle indie-pop band that has been writing my favorite songs since 1996. 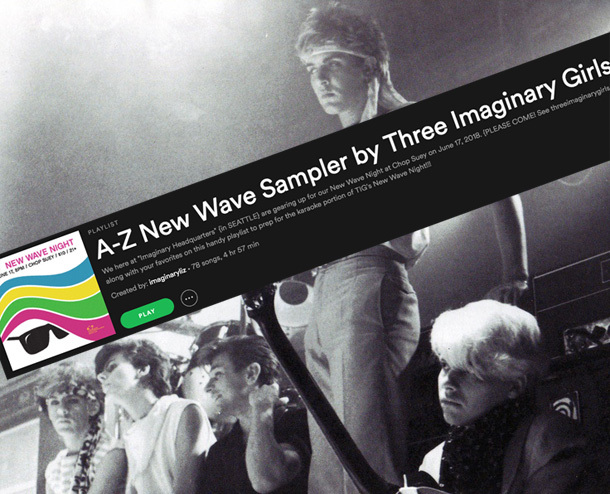 Three Imaginary Girls first met them in 2002, just 2 months after this website launched, when imaginary dana reviewed their show (I sadly wasn’t there and hadn’t ever even seen the band play live). As you can tell from the TIG-Tullycraft archives, we became fast friends. You’d think given the fact that I am personally close friends with everyone in the band (and – not so newsy flash – I’m married to the band’s lead singer), we would have all gotten together for a public discussion before now. It took the release of the (IMHO) brilliant new album (The Railway Prince Hotel) to corral some of my favorite people into one chat room. We get to talk about Delaware, “the incident,” normcore, and – of course – coffee. This column is called Coffee with a Rockstar – so what’s your coffee drink of choice? Chris: My daily coffee is a french press with milk and sugar, I try not to get too technical but I have a very exact method of preparation. If it’s a weekend I might add a spoonful of ovaltine and a squirt of whipped cream. Corianton: Chris said “squirt.” I don’t really drink coffee, but if I feel like bending the rules I might make a decaf Thai iced coffee at home. Jenny: Fare-trade, shade-grown latte with a mix of soy and coconut milk. I’m a jerk. Sean: Coffee Rios (Original Roast) – premium coffee candy. I’ve tried to rope Chris into my addiction. Speaking of caffeine treats, in “Vacaville”, you sing “a handful of excedrin helped” – what substances to you gravitate towards in times of difficulty? Chris: I also find myself gravitating to substances in time of ease, so there’s that. People think I have developed a bit of an addiction to Coffee Rios, but I’m good as long as I never run out of my supply. Corianton: Dark chocolate and Super Mario Brothers. It’s a multi-tiered regression (or a midlife crisis). Sean: A handful of Excedrin (usually). Jenny: Vodka. And Harry Potter! Sean: Actually, our friend Wayne recently put together a video for the song “Vacaville” and I needed to take a couple Excedrin after I watched it. It sorta made my head spin… in a good way. Thanks Wayne! Digging more into the new album, there are quite a few points that had that happysadhappy feeling to them. On first pass they felt upbeat, but when I dug into the lyrics, they had a dark side to them. For example: “The Cat’s Miaow In a Spacesuit” sounds like a cute song, but then you sing about hating one another. What around you does everyone else seem to enjoy that you can’t swallow? Sean: Recently someone explained “normcore” to me. It seems pretty stupid. Have you guys heard of normcore? Corianton: Sean, you invented normcore. Sean: I agree. I am pretty normcore it a lot of ways, but it was never an intentional fashion decision. Chris: Sean has never made an intentional fashion decision. Sean: That’s probably true. I guess I can’t argue with that. Jenny: High-waisted jeans = super boo. Sean: Is “super boo” good or bad? “Passing Observations” (also on the new album) is a super catchy song with a seemingly bleak statement on the current state of the world. How does the band stay positive? Chris: It’s funny ‘cause when we were recording the song I had demo versions I was working on at home and my kids were overhearing that song and got hooked on the “ship is sinking, I don’t care” chorus, my 6 and 10 year old singing along to it was making it the exact opposite of “sad”. The comedian Steve Martin used to do a bit about how you just can’t play a sad song on a banjo. Maybe we’re kinda like that? Even the very best Tullycraft murder ballads are still kinda toe-tappin’ sing-song affairs. Sean: It’s true. Our murder ballads do tend to be pretty catchy. I still laugh when I think about that line that refers to Mates of State in the song “Clique At Night Vandals.” It goes: “So many songs that sound alike we should kill them in their sleep.” I remember saying to Chris, “I’m not sure I’m comfortable singing this,” and he said “Don’t worry, we’ll get Jenny to sing it.” And when she did it sounded amazing! It still cracks me up when I hear it. Jenny: Murdercore! Apparently it’s also a thing, who knew?!? Delaware is the first state. Why did you choose to honor it with its own pop song now? Sean: Delaware locals tend to be both defensive and proud of their state. They are defensive over their perceived insignificance, and very proud of the fact that Delaware was the first sate. As a visitor you will be constantly reminded of this fact. I like Delaware, but each time I’m there an odd social exchange will inevitably occur, and when I curiously look at my wife [Ed. note: full disclosure, that’s me] she will simply say “it’s not explained, it’s Delaware.” The song is very loosely based on these exchanges. Fun fact: if you listen close you may hear references to both Caesar Rodney, the 1776 Continental Congressman from Delaware and Nervous Twitch, the Leeds-based garage/punk band. I’m certain this is the first time those two have been featured in a song together. Jenny: Some of our favorite people come from Delaware! You all each have busy adult existences. What aspects of your now adult life seem to be inspiring music that maybe didn’t 5-10 years ago? Sean: Hmmm? I’m not sure how our adult lives influence our music. I guess our limited free time influenced how we recorded this album, which in-turn inspired the music we made. It wasn’t easy to schedule time for all of us to be in the studio together. Sean: I always thought the chant in Anacortes was based on an old merchant sailing vessel sea shanty. Do you have a song on the new album that most surprised you? And why? Sean: Gosh, that’s hard. I like different songs for different reasons. The first song that really clicked for me while we were recording this album was “Passing Observations.” We’ve recorded so many songs over the years that sometimes new songs tend to remind us of older songs for one reason or another. “Passing Observations” felt completely new to me. Which was exciting. Sean: When I introduced the song “Midi Midinette” I imagined it sounding sorta punk (i.e. “The Punks Are Writing Love Songs”), so I was surprised when Chris played a ska-ish guitar line along with it, and then suggested that we get Evan (Mosher) to record trumpet as well. There were a number of surprises while recording this album. Sean: The entire recording process this time around was outside of our usual comfort zone. We improvised many of the songs in the studio. Usually when we record an album we show up fairly well rehearsed (well, sort of well rehearsed). This time around we almost never knew what we were going to play on any given day. There is definitely an element of excitement not knowing the direction a song might take. Most of the time this approach worked surprisingly well for us, but there were occasions where we’d end up on the wrong path. As long as you’re open to backtracking or starting over this way of recording can be super liberating and fun. For me, the airy sing-along vibe of “Hearts at the Sound” is perfect for a road trip mixtape. What is one song you think is perfect for a road trip mixtape? Chris: I like the way that song came together. It’s got an “easy to get in bed with” guitar drone. Sean: “Romeo Had Juliette” by Lou Reed is the perfect way to start any road trip mixtape. I might follow that with “Vincent Van Gogh” by Jonathan Richman & the Modern Lovers. Then maybe: “Nobody Cares” by Superorganism. I could go on and on. Corianton: Any song heavily featuring Jenny Mears is the perfect road trip sing-along. Sean: Wait, did I misunderstand this question? I like all those road trip mix tape suggestions! What is your favorite Tullycraft-related memory? Corianton: Ice skating in Beloit? Falling down the basement stairs after the NYC Popfest? Headlining the 40 Watt? Jenny: Those were so fun! As was touring the different Athens band sites and bicycling along Lake Champlain! And then there was all the Jagermeister…. Sean: At one point we found ourselves driving through a white-out snowstorm in Wisconsin. It was terrifying when we were actually doing it, but now I look back on it as truly amazing band memory. Chris: That snowstorm was crazy! That rental mini-van was well tested on that tour. I think maybe our first SXSW stands out as a kinda magical musical memory, I think we felt unusually welcome and included and met a lot of our heros, I met Billy Bragg waiting in line at a free mexican buffet. I think that’s one of my favorite Tullycraft memories, too. What is a specific Tullycraft-related memory you’d rather not relive? Corianton: I want to talk about the incident!!! We can’t heal if we don’t communicate. Sean: Cori, I agree. But the “incident” is a no-go. Hi - I'm Imaginary Liz! As co-founder of Three Imaginary Girls, I've been living the life imaginary since 2002. If you want to make my day, quote Bright Eyes lyrics, sing verses from Blur songs, or talk about the virtues of the first Bluetones album. Yep, I love bands that start with B... but I also have a penchant for bands that begin with the letter T, W, F, S, and sometimes Y.